Re-reading the Fantastic Four comics from the start. Last week, we saw the aftermath of Secret Wars, this week let’s find out what happened while Marvel’s biggest heroes were away in space. 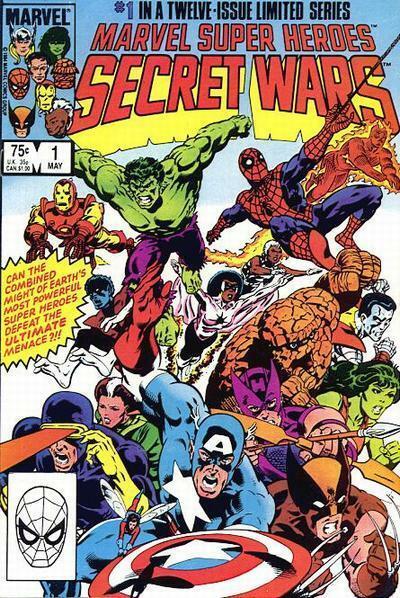 There’s a lot of ground to cover, but because this is a Fantastic Four post, I’m going to try to focus on Secret Wars just from the FF’s perspective. A bunch of Marvel heroes appear out of nowhere in space, inside the giant machine that abducted them from Earth. There’s a quick roll call. In addition to Reed, Ben, and Johnny, we’ve got some Avengers: Captain America, Iron Man, Thor, Hawkeye, She-Hulk, Wasp, and Captain Marvel. For the X-Men, there’s Professor X, Wolverine, Cyclops, Storm, Nightcrawler, Colossus, Rogue, and Lockheed the dragon. Spider-Man and the Hulk are here as well. Finally, there’s Magneto, who stands alongside the X-Men but whom everyone considers an enemy. Continuity notes: This is when Jim Rhodes was Iron Man, Monica Rambeau was Captain Marvel, the Hulk had Bruce Banner’s intelligence, and Professor X had regained the ability to walk. A second construct appears in space, and this one’s full of villains. We’ve got Dr. Doom, Galactus, Ultron, the Molecule Man, Kang, the Enchantress, Dr. Octopus, the Lizard, the Absorbing Man, and the Wrecking Crew, which is made up of the Wrecker, Piledriver, Thunderball, and Bulldozer. Dr. Doom is so brainy that he knows who all the other baddies are, and he does the roll call by himself. Things get all cosmic as everyone sees an entire galaxy destroyed right in front of them. Remnants from the destroyed galaxy are reformed into a single planet orbiting its last surviving star. (We’ll come to know this planet as Battleworld.) An opening to another universe appears. A voice comes from within saying the famous words, “I am from beyond! Slay your enemies and all you desire shall be yours! Nothing you dream of is impossible for me to accomplish!” Galactus and Dr. Doom try to attack this creature, but they’re thrown down to the planet. Galactus coins the name “Beyonder” in the process. All the heroes are then beamed down to the planet’s surface, where they make camp in a giant, abandoned alien fortress. The heroes argue for several pages about what to do with Magneto, and whether he’s friend or foe. Johnny, strangely, is the one who’s had enough and tries to attack Magneto. Magneto swats him down and then flies off. There’s a couple more pages of the heroes voting on who should be their leader. Professor X nominates Reed, but Reed says he’s too worried about his pregnant wife at home to be an effective leader. (He also pulls a George Lucas by stating that Sue is “a billion parsecs away.”) It takes them forever to choose Captain America as team leader. Elsewhere, all the villains except Galactus meet up at a futuristic fortress of their own. 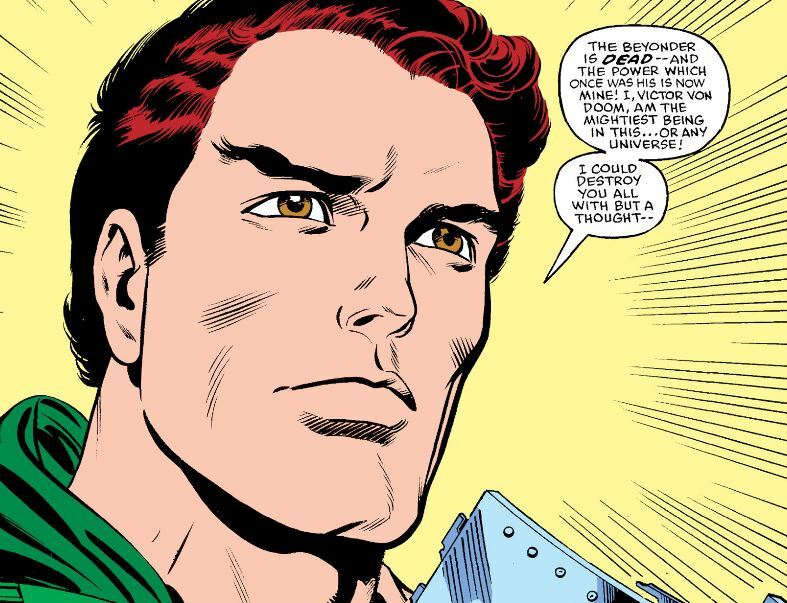 Doom says they shouldn’t play the Beyonder’s game, but instead go after the Beyonder himself. The villains fight each other, and Kang tries to blow up Doom. The heroes investigate the explosion. Doom survives and flies off alone, while the rest of the villains attack. Big fight! The baddies get the upper hand, and Reed uses his body as a shield to protect his unconscious teammates from falling debris. She-Hulk dukes it out with the Enchantress, managing to knock out the Asgardian. The heroes win the fight and take several hostages. At the heroes’ fortress, Reed puts the villains in “psychostasis” after figuring out how to work the alien machinery. We then spend a lot of time with Dr. Doom, who insists he is the equal to the godlike Beyonder. He finds Ultron, who got zapped in the first villain fight, and reprograms him. Doom takes over as leader of the rest of the villains now that he has Ultron as his personal bodyguard. Galactus stands on a mountaintop and stays there, motionless. All the heroes go through a “what if we never get home” phase. Ben worries that he’ll never see Alicia again (if only he knew what was going with Alicia…), and She-Hulk admits that underneath her tough-girl bluster she’s having a tough time keeping it all together. Johnny is more upbeat, saying the FF have been trapped in space before, and they always make it home. Johnny and Spider-Man discover Magneto snooping around the heroes’ HQ. Johnny uses the “4” flare to summon the rest of the group. As Magneto escapes, Ben transforms from the Thing back into a human! It’s more down time as a huge storm ravages the whole planet (Thor loves it). Reed gets really depressed and wanders off by himself. There’s a big fight between Spider-Man and the X-Men when he overhears them wanting to leave. Professor X erases the fight from Spidey’s memory before Spidey can tell Reed. Over at Doombase, as it’s now called, Doom creates two new villains by using the alien machines to give two women superpowers. They are Volcana and Titania. It’s also here that we learn an entire suburb of Denver was taken from Earth to become part of Battleworld. The storm ends, and the villains attack. Johnny gets a couple of broken bones and the still-human Ben is knocked out. Volcana, although still getting used to her fire powers, manages to defeat She-Hulk. 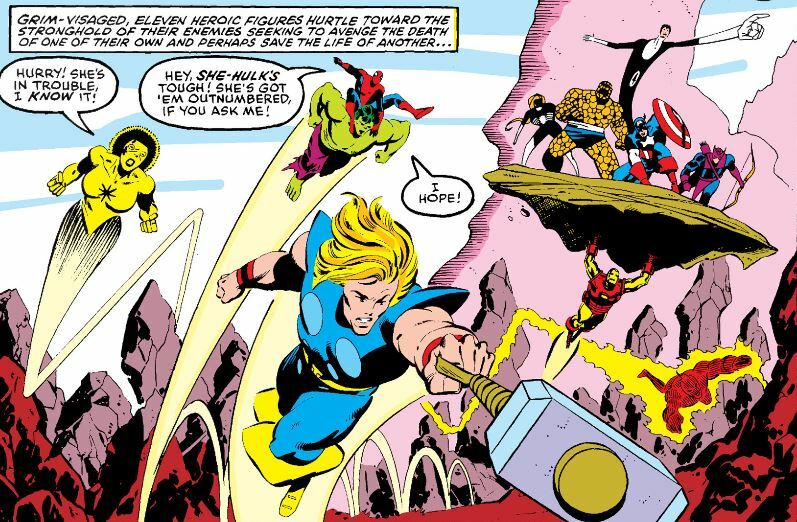 Molecule Man destroys the heroes’ fortress, forcing them to regroup in the wilderness. Molecule Man then drops an entire mountain on the heroes, but the Hulk’s awesome strength saves everyone. 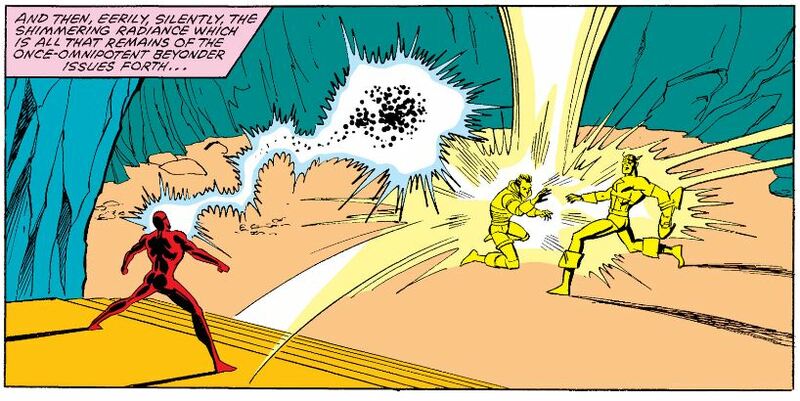 Reed uses his brains to combine Iron Man’s armor, Spider-Man’s webshooters, and Hawkeye’s trick arrows to power up Iron Man so he can dig everyone out from underground. 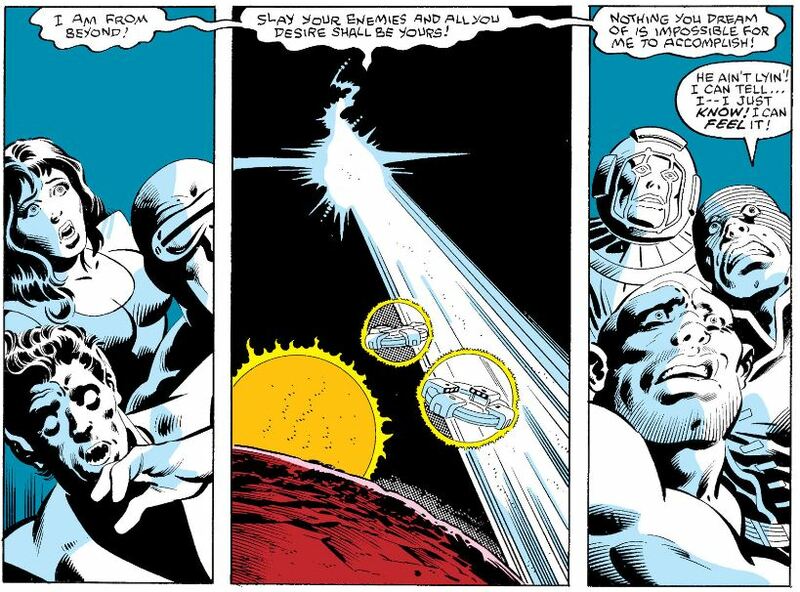 Elsewhere, Doom remembers that Kang tried to kill him and orders Ultron to kill Kang. (Harsh!) Then there’s a lot of drama about the X-Men and Magneto forming a third “team” on the planet. The heroes find their way to a village, complete with white-haired peaceful aliens. The only problem is, it happens to be right under the mountain where Galactus is standing on his silent vigil. One alien, a beautiful young woman, welcomes the heroes. She’s the village healer, and takes away Johnny’s injuries with her healing powers. Johnny is immediately smitten with her. Ben transforms back into the Thing, seemingly at random. Reed suspects he knows why Ben is transforming, but he doesn’t say anything. Galactus’ home ship (the one we first saw way back in FF #49-51) arrives alongside the planet, and everyone panics, wondering what the big G is up to. Johnny consoles the alien girl, even though he doesn’t understand her language. She takes him into her bedroom (wha-hey!) where she has him inhale a strange gas (wha-HEY!). They share a psychic vision, and he learns her name is Zsaji. (Most folks pronounce this “Zah-shee” but I wonder if it’s “E-zah-shee” because the text specifies that his injuries ease under her care. Whatever.) They kiss, totally in love now. 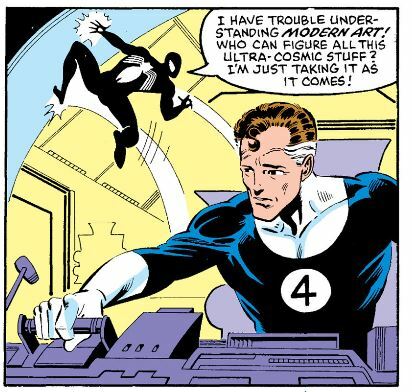 Reed tries to communicate with Galactus, hoping Galactus will respond because Reed once saved his life. This happens just as Professor X tries to telepathically communicate with Galactus. Galactus summons a robot from his home to attack the heroes. More fighting! He also starts building his world-eating machine on the mountaintop. Johnny manages to burn the robot from within, destroying it. The heroes can’t catch their breath, because that’s when the villains attack. It looks the bad guys will win, only for the X-Men to arrive and save the day. The baddies run off, but not before Colossus is injured. 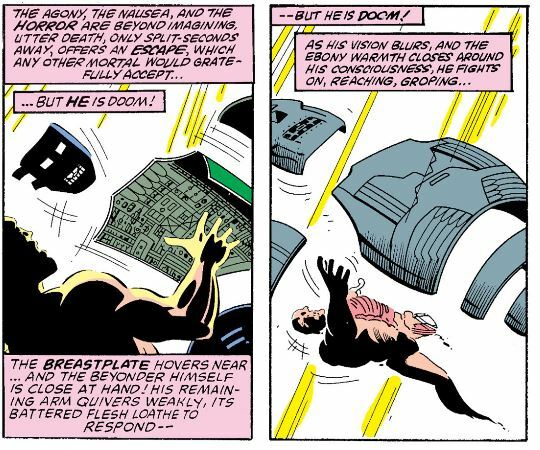 Doom takes advantage of the distraction and sneaks aboard Galactus’ home ship, looking for a way to defeat the Beyonder. Colossus stays behind to be healed by Zsaji, while the X-Men confirm that they are separate allies to Captain America’s group. Zsaji makes Colossus think of his girlfriend Kitty, who is back on Earth, but he becomes fascinated by Zsaji as she heals him. A brand-new Spider-Woman shows up (this is the Jennifer Carpenter Spider-Woman). She was fighting crime in that Denver suburb (what’s going on in Denver?) and she joins Cap’s team. The Wasp is seriously injured in a fight with the Wrecking Crew. She-Hulk wants revenge, but Captain America says they need to stay put and keep an eye on Galactus. A bunch of volcanoes go off as a result of a big X-Men vs. villains fight, and this slows down Galactus’ progress. Along the way, Galactus senses Doom inside his house and teleports Doom back to the planet. She-Hulk attacks Doombase on her own, only for Titania and the Wrecking Crew to beat the crap out of her. It’s totally brutal. At the village, Hawkeye wants a rescue mission for She-Hulk, but Captain America, worried about Galactus, says no. Professor X contacts Cap, saying the X-Men will take over watching Galactus so Cap and company can rescue She-Hulk. Captain America’s group launches a full-on assault on Doombase, for an issue that’s all one big fight. Ben transforms back into a human while fighting the Absorbing Man, and he has to be saved by Spider-Woman. Johnny uses his nova flame on Ultron. This doesn’t destroy Ultron, but it does manage to short out some internal circuitry of his, taking him out of the fight. In one of this series’ silliest moments, Ben and Hawkeye come across Klaw and the Lizard. Rather than fight the two, Ben and Hawkeye incapacitate them by convincing them to play patty-cake. Yeah. Captain America confronts Dr. Doom, but Doom is too weakened from his experience in Galactus’ home. The fight ends, and the heroes make Doombase their new home. Reed treats She-Hulk and the other wounded in the Doombase infirmary. There’s one panel (One!) where Reed says Doom died the last time the FF encountered him, and he has no idea how Doom is alive here. (You’d think they would have addressed this in the first issue.) Back at the village, Colossus realizes Zsaji used all of her healing powers at maximum to save the Wasp, who was injured earlier. Colossus falls madly in love with Zsaji. It’s during all this that Spider-Man gets his famous black costume. Galactus finally makes his move, and starts to devour the planet. The X-Men rush in and try to stop him. Big fight! The rest of the heroes are en route to join them, when Ben and Johnny get into some old school FF bickering and Ben transforms back into the Thing. Spider-Man shows off all the cool tricks his new costume can do. Reed says he’d like to check out the costume in his lab back on Earth. Cap’s team joins the X-Men and Cap leads everyone through Galactus’ defenses. Just when it looks like they’ll win, Reed has an epiphany and says they must not fight. He says this is their chance to rid the universe of Galactus. If Galactus devours the planet, he’ll win the Beyonder’s game. Galactus’ reward, Reed believes, will be to ask the Beyonder to take away his cosmic hunger, so he never has to devour a planet again. Just as Reed explains all this, he’s teleported away. Galactus takes him aboard his ship. He shows Reed a vision of Sue and Franklin back on Earth, and then he asks Reed to heed his words carefully. At Doombase, Dr. Doom gets his strength back and escapes from the cell the heroes put him in. In the village, Zsaji also has her strength back, and wants to be with Johnny. 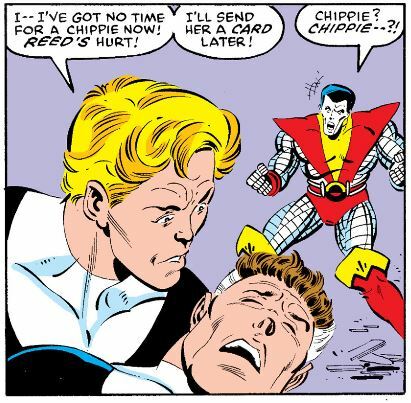 Johnny’s too busy worrying about Reed’s safety for romance, though. Reed returns and says Galactus called him a “champion of life.” Reed explains again that they must not fight, giving up their lives to save countless planets from Galactus. Captain America doesn’t buy it, saying he’s going to fight. Cap’s group and the X-Men form a single team again, and they battle Galactus some more. Then Reed changes his mind, and he, Ben and Johnny join them. 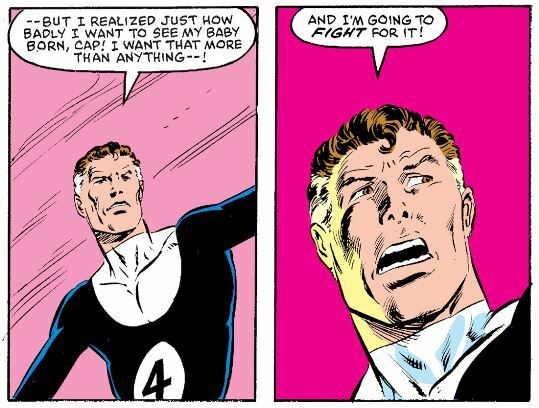 Reed says he can’t bear never seeing Sue or his unborn child again, the universe be damned. Iron Man, Thor, and Cyclops trash Galactus’ planet-eating machine, so Galactus travels back up to his home ship, and devours the whole thing the same way he did with the Skrull homeworld. The portal to the Beyonder’s universe opens up so the Beyonder can watch what’s happening. Galactus becomes so full of the Power Cosmic that he shines brighter than the sun. Reed fears Galactus will devour Battleworld next, for even more power. Suddenly, all the energy is ripped away from Galactus, and toward Doombase. Dr. Doom has taken Klaw, cut his body up into lenses (remember that Klaw’s body is made of solidified sound, so I guess that works) and used the lenses to steal Galactus’ power. The heroes return to Doombase, and they have yet another “is Magneto a good guy or not” argument on the way. (Is now really the best time, you guys?) Doom decides that the power of Galactus is not enough. He flies into space to confront the Beyonder. At Doombase, the whole building is rocked with shockwaves coming from the Beyonder’s portal. Some debris falls on Reed, but it only knocks his breath out. Colossus sees on a monitor that Zsaji is injured when a shockwave hits her village. When he tells Johnny, Johnny is too upset about Reed to care. Johnny famously (infamously?) says “I’ve got no time for a chippie now!” Colossus doesn’t like hearing this. 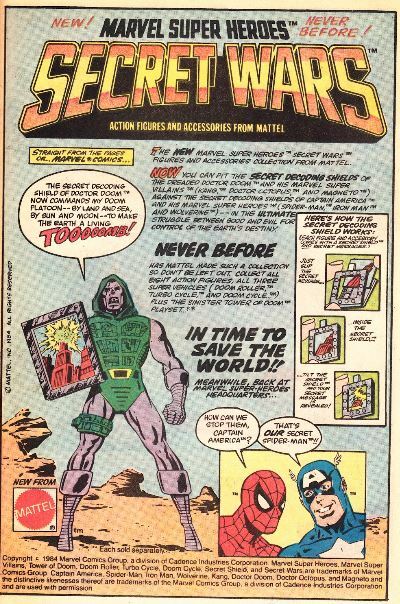 Inside the Beyonder’s portal, Doom attacks. We don’t actually see the Beyonder, just waves of white light fighting back against Doom. Doom’s leg gets cut off (!) and it looks like he’s dead for real this time. An image of Doom appears before the heroes, asking them to add their power to his, because the Beyonder is their common enemy. None of them do, although Magento is tempted. Inside the portal, the Beyonder takes an interest in the battered and beaten Dr. Doom. He reads Doom’s mind and takes apart Doom’s armor. It’s really freaky. Despite looking totally helpless, Doom’s inner thoughts maintain that he is Doom! More shockwaves hit the planet, and a bright light shines down on all the heroes. It’s Doom. 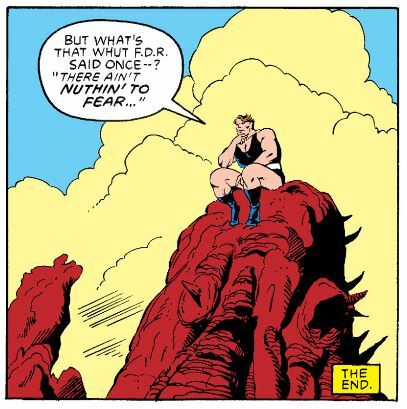 He has somehow defeated the Beyonder and taken all his power. Yes, Dr. Doom has achieved true omnipotence, with the infinite power of a god. Captain America tells every to brace for a fight, but Doom removes his mask, showing his perfectly-healed face, and announced that the war is over. Doom says he doesn’t want to fight. He and the heroes are separated by the Molecule Man, and there’s a bunch of business where Doom uses his power to unlock Molecule Man’s mind, revealing MM to have similar godlike abilities. Captain America goes back for a private meeting with Doom, where he learns that Doom’s next step is to invade the afterlife and bring his mother back from the dead. While all this is happening, a strange energy possesses the Hulk, then Spider-Woman, and finally Klaw, who is living with Doom in the tower. Back at Doombase, Captain America doubts Doom has given up his humanity. Cap says Doom’s healed face and love of his mother mean he’s still human on the inside, and no human should have that much power. Cap puts it to a vote whether to attack. It’s unanimous in favor, although Colossus takes a lot of convincing. The second Colossus votes “Yes,” there’s a huge explosion from Doom, and everybody’s dead. 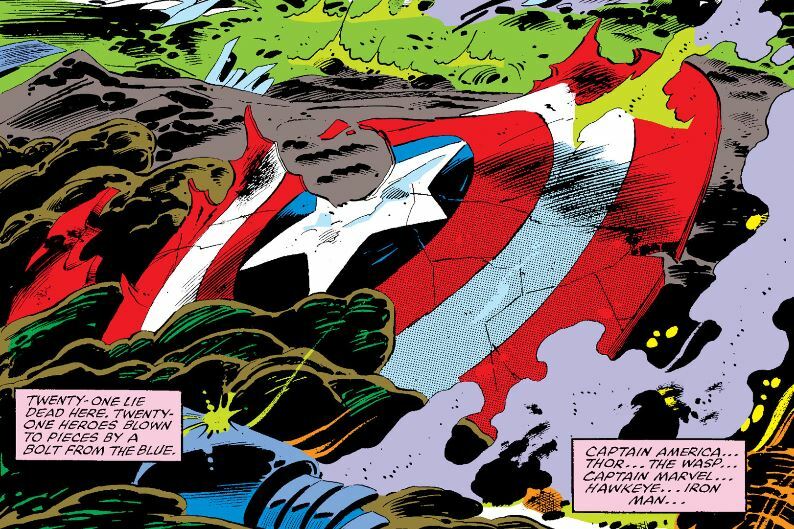 The final issue opens on Captain America’s indestructible shield, completely destroyed. There’s a long scene following the villains in “Denver” where we wrap up some of their subplots. Of note to Fantastic Four readers is sequence in which Dr. Octopus goes insane (more insane than usual), questioning reality in the face of all this cosmic grandeur. At Doom’s tower, Klaw asks whether Doom could subconsciously bring the heroes back to life without realizing it. Doom says that is impossible. Klaw then imagines a scenario in which Zsaji makes her way to the heroes and gives her life using her power to revive all of them. He adds that planting this idea in Doom’s head means that Doom is unknowingly making it happen with his powers. Doom flips out with anger, insisting over and over “They are dead!” That’s when the hammer of Thor bursts through the wall. Furious that the heroes are back, Doom almost wipes out the universe with a single thought. He gives Klaw a little bit of his power to keep the rest in check. Outside, all the good guys are indeed back in fighting form, launching a full-on assault. Klaw revives Ultron and creates a bunch of monsters for everyone to fight. During the battle, Ben discovers he can control his transformations from human to the Thing and back. He gets teary-eyed among the violence, and She-Hulk is right beside him when it happens. Captain America fights his way inside to confront Doom. Doom kills him, but Cap keeps coming back to life over and over, due to Doom’s psychological inner turmoil. Doom loses control of his power, and it looks as if the universe will be destroyed. Unstable molecule: Although Captain America is the main protagonist here, Reed is his right-hand man, acting as the brains of the group. He rebuilds Iron Man’s armor and he constructs a high-tech cast for the Hulk, who broke his leg in the final battle. After spending the first half of the book worrying that he’ll never get home, he’s the one who steps up and actually make the return to Earth possible. Fade out: We’re told that Sue could go into labor at any minute, giving Reed a sense of urgency to get everyone home. 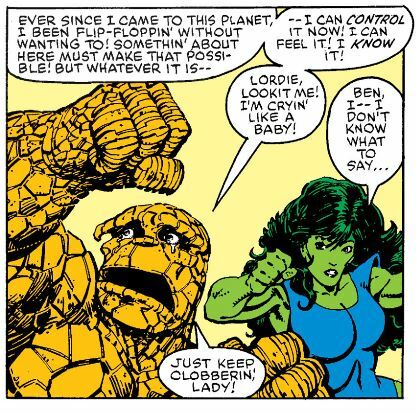 Clobberin’ time: Ben shows a lot of loyalty to Reed through this series, often saying that Reed speaks on behalf of the FF. This is setting Ben up for a fall, because his later experience on Battleworld will eventually put him in conflict with Reed. Flame on: It’s true that Johnny gets over Zsaji real quick. He rarely mentions her after this. Colossus carries a torch (heh) for Zsaji for a little while longer in Uncanny X-Men, but he too moves on soon after. Zsaji is kind of a forgotten Marvel character today. 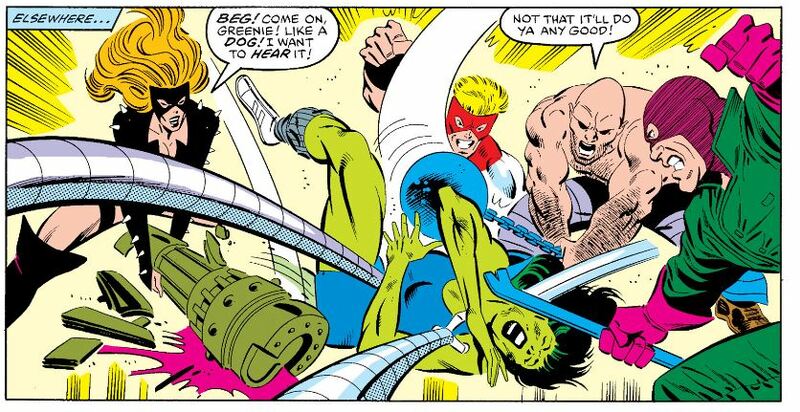 Fantastic Fifth Wheel: She-Hulk is a jokester at first, but then shows her rare “savage” side when she takes on the villains by herself. One of the scariest moments in the whole series is when the bad guys all beat the crap out of her. Four and a half: Franklin appears in the vision Galactus shows to Reed, so Reed knows the kid is OK.
Other effects of Secret Wars didn’t last as long. The Hulk’s broken leg only lasts one issue. Iron Man’s new souped-up armor stops working as soon as he gets home. Professor X takes over as field leader of the X-Men (complete with a hokey yellow-and-black costume), but the mutants start arguing about this choice not long after they get back. Fantastic or frightful? The Fantastic Four are front and center throughout Secret Wars, showing just how popular they were during the Byrne years. 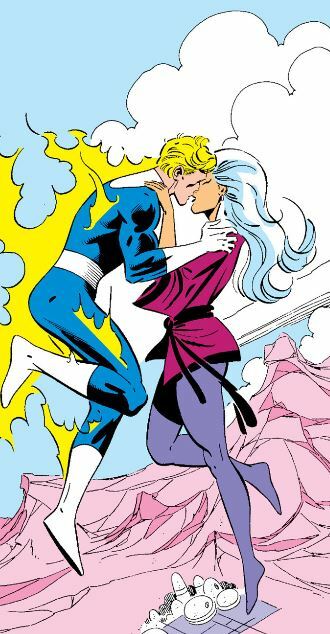 Really, though, all the Marvel heroes get some character development during the series (except for poor Nightcrawler, who contributes nothing). The art is a little clunky, but never confusing given how many characters are running around. Overall, Secret Wars is terrific — a great, glowing throwback to that forgotten age in which a big comic book crossover wasn’t just a cash grab, but actually something to be excited about. Next week: She keeps her face in a jar by the door.